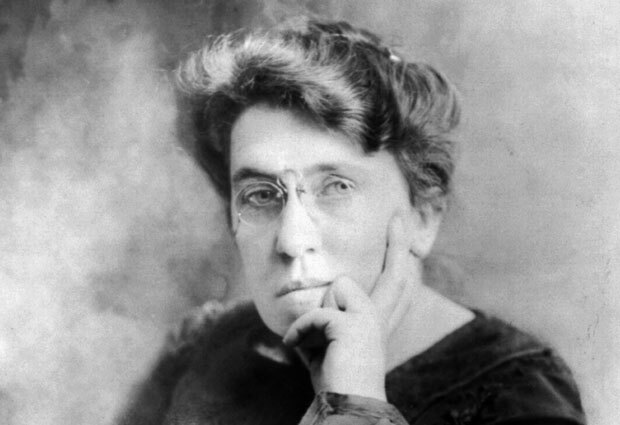 Renowned political activist and anarchist, Emma Goldman, who rebelled against a chauvinistic society by advocating on issues such as peace, free love and birth control during a period when women were considered as inferior beings, was born on June 27, 1869 in Kaunas, located in the Russian province of Lithuania. Emma entered the world during times of serious political turmoil, the Bolshevik Revolution was beginning to spark and discontentment with the Czar’s autocratic regime was at its peak. Emma belonged to a Jewish family, and was the third child of Abraham and Taube Goldman. She was a rebellious child, which was unsettling as she lived in a society that placed men as more superior to women. During her youth, she was often forced into sparring with her father, who was a hot-headed and intolerant man, and openly expressed his discontentment with Emma’s birth instead of a son he had always desired so deeply. Being a traditional Jewish father, he wanted her to settle down with domesticities and planned to arrange a marriage for 15 year old Emma. Emma, however, had other plans, she wanted, more than anything, to avail the chance of pursuing an education and carving out a career for herself. Goldman spent most of her childhood and youth in Kaunas, Konigsberg and St. Petersburg. In 1885, she, along with her sister, migrated to the United States to join their other sister living in Rochester, New York. The apartment they lived in was crowded as her two sisters and brother in law, all had to cramp into the tiny place. Soon, Emma secured employment at a coat factory, where she was paid a salary of $2.50 for sewing for ten and a half hours a day. Her indigent and impoverished working and living conditions led her to find refuge in anarchism, and she joined the labor movement which was yet undergoing a budding phase. Goldman became a member of several radical societies, and began actively participating in agitations and protests, advocating for improvement in working conditions, particularly the demand of an eight-hour workday. Goldman’s opposition of labour injustice was intensified by the tragic Haymarket Square incident that took place in Chicago in 1886. Emma was shocked at this atrocity, and she committed to the cause of the laborers with renewed zeal and passion. She began frequenting the anarchist circles, participating in meetings, and devouring the militant anarchist magazine, Die Freiheit (Freedom). Her intense commitment to the cause and her regular involvement in agitations led her to move to New York in 1889, as a 20 year old Emma wanted to be at the heart of the revolutionary anarchist activity. Soon, Emma Goldman’s fame as an anarchist grew and she was given the title of Red Emma. She devoted her time to writing, traveling and lecturing in order to spread the message of anarchism and to garner support for the labor movement. Emma’s movements were constantly traced by trailing detectives and in 1893, she was jailed for a brief period under the accusation of urging and provoking workers to create uproar. Upon her release from jail, Emma decided to move to Vienna and begin training as a midwife and nurse. However, she shortly returned to New York where resumed her radical activities and earned the status of a prominent anarchist lecturer. Her lectures were attended by affluent citizens as well as the destitute members of the working class. In 1901, she became embroiled in a raging scandal when she was apprehended for provoking the assassin of President William Mckinley, just because the assassin had been present during one of her lectures. No official charges were filed against her, however, the newspapers created a massive wave of controversial propaganda against her all over the US, branding her as a wicked traitor. In 1906, Emma founded her own magazine ‘Mother Earth’ which became the voice of anarchism and feminism. It quickly attained the status of a prominent rostrum for the growth and spread of anarchist and feminist ideologies. She continued to publish the magazine till 1917, while making extensive travels to lecture and educate people on the principals of anarchism. However, the liberal freedom that political activists enjoyed in the US prior to the World War I began to get constricting and limiting when USA joined the war effort. The government became extremely critical and fearful of the propaganda generated by pacifists, anarchists, leftists, and especially, foreigners. In 1917 and 1918, the government began imposing strict legislations to limit the opposition of war and the liberal activities of extremists and radicials, such as the Selective Service Act, the Espionage Act and the Sedition Act. Regardless of the pressure exerted by the government, Emma went about her radical activities as usual, and moreover, she, along with Leonard Abott, Berkman and Eleanor Fitzgerald, organized the No-Conscription League with the motive of opposing “all wars by capitalist governments”. She used her magazine Mother Earth to publish anti-war content and to incite the masses to refuse to conscript. In light of these anti-war activities, Goldman, along with Berkman, was arrested on charges of being an accomplice in preventing draft registrations. They were fined $10,000 and sentenced to two years in prison. In 1919, she was deported to Russia when USA was overtaken by a violent wave of the red scare which led to the arrest and deportation of countless leftisits, anarchists and radical political activists. Emma tried to carve out a fulfilling life for herself in Russia, however, she soon became disillusioned with the oppressive and restraining tactics of the new government. She has described her disappointment with the Bolshevik government in her book, ‘My Disillusionment in Russia’, which she published in 1923. In 1921, Emma left Russia for Germany, where she resumed giving lectures. In 1924, she relocated again, this time to England, but her heart was in the United States and she desperately wished to return there. She married James Colton, who was British and provided her with British citizenship. She harbored dreams of acquiring a British passport which would take her to Canada and then, assist her gaining access into USA. She commenced traveling throughout Europe, conducting lectures and publishing her work during the 1920s and 30s. In 1931, she published her autobiography, entitled ‘Living My Life’. In 1934, Emma’s dream to return to the US came true, however, it was only granted for a brief period of 90 days as she was invited on a lecture tour. In 1940, Emma Goldman suffered a severe stroke during a trip to Canada where she was working to garner support for the anti-Franco efforts in Spain. She died on May 14, 1940 after suffering for several months in Toronto. According to her wish, she was laid to rest in Chicago, USA.